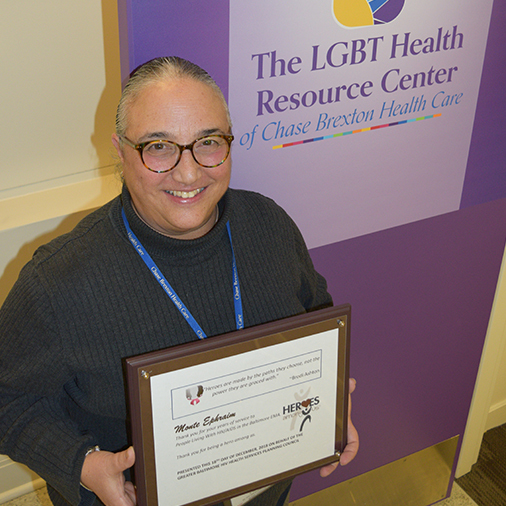 Home > Blog > LGBT Health Resource Center's Monte Ephraim Named "Hero Among Us"
LGBT Health Resource Center's Monte Ephraim Named "Hero Among Us"
Monte Ephraim, Manager of Behavioral Health Services and LGBT Older Adult Programming at The LGBT Health Resource Center, was recently named a Hero Among Us by the Greater Baltimore HIV Health Services Planning Council. Ephraim was honored for her years of service to those living with HIV/AIDS in the Baltimore area. In addition to providing direct services to patients, Ephraim oversees several programs and groups for the Center. Among the groups is the 50+ HIV Support Group, which offers community and resources to individuals 50 and over affected by HIV.